There is so much to see, do, learn about, ask about, and wonder about in this natural setting. Public art pieces lead students and visitors into the NEC. 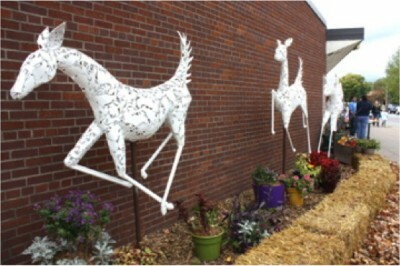 Four life-size leaping deer with ‘skin’ made of regional animal and plant shapes are placed along the adjoining school building with a fifth deer reclined inside the gate to welcome one and all. Guided by staff, parents and the community, a local artist designed a beautiful motif arched entryway feature. Great Blue Heron parents and chicks welcome all to enter. Original signage from the school has also been included. Once inside, students may explore a life-size tipi, buffalo hide and Native American story books; items donated by the district’s American Indian Education program. An enormous “tree cookie” provides a sense of history and demonstrates the effects of time and natural forces on living things. A life-size replica of a bald eagle’s nest was built on a deck and adorned with sticks similar to what an eagle pair would use to build their nest. To tell the story of the eagle’s nest, a children’s book has been mounted on a small podium at preschooler level. Sticks are available for students/visitors to add and interpretive signage shows what eagles eat and how to find the nearby Sherburne National Wildlife Refuge with its many eagles, abundant wildlife, and pre-settlement habitats and vegetation. Trees add shade, provide shelter, define a natural boundary and add to the sense of beauty, security, and serenity of the Nature Explore Center. Stately old trees are grounding as well as beautiful and provide interest in all seasons. In spring the ornamental trees show off their flush of blossoms as the school year nears its end. Perennial borders offer color and interest throughout the growing season. Plants like lambs’ ears are soft to touch. Others, like roses and peonies, are fragrant. Many of the plants are native and attract butterflies, dragonflies, and a variety of pollinators. Later in the season, grapes and tomatoes make for great eating. The sound of the wind in the pines is not only restful but also virtually part of the heritage of Minnesota. These natural features provide both beauty and a sensory experience. 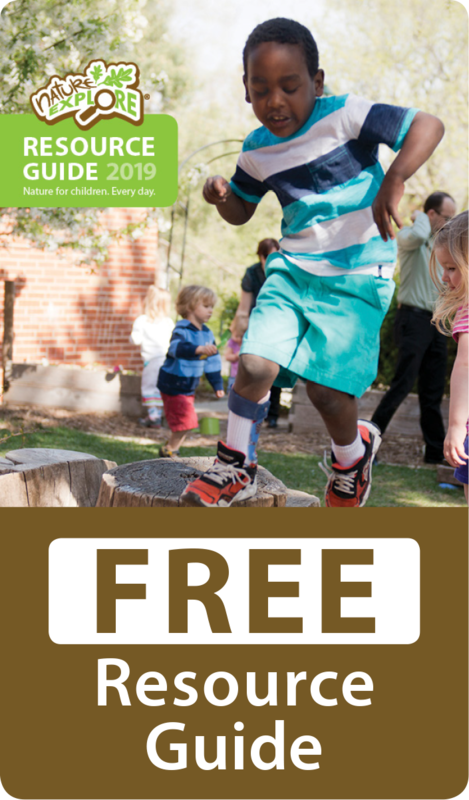 Delineated areas provide places where students can draw, paint, learn about seeds and plants and how they grow and create impromptu performances. 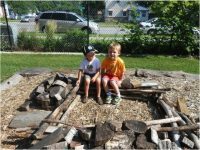 There are materials for building and pretending and for digging and shaping the sand. Beyond the natural features, the design and layout of the NEC lend a sense of order and flow into which the art pieces fit almost organically.